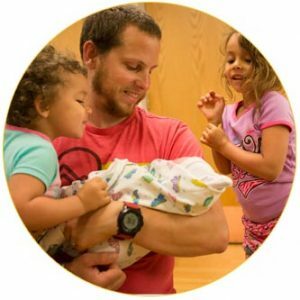 In those first few days after birth, babies are curled in the loving arms of their parents who can’t seem to look away from their newest addition. If this baby is not the first to join its family, siblings are often very interested in this new tiny person. A Fresh Baby Session is perfect in the first 48 hours. When your family is meeting their new baby for the first time and counting fingers and toes. These sessions take place during daylight hours and are a good alternative to birth photography for those that are excited about creating images of their baby as soon as possible, but not interested in having their birth documented. Of course you’ll bring your camera to your birth. And you’ll cherish the images you create. Including a professional photography session in your first few days after birth though, guarantees images showing your baby in all its wonder. It also guarantees that you will be in pictures with your baby – because you were there too! So often parents (moms especially) are missing from pictures because they were taking them. That’s important. But this is definitely a time you want to be in pictures with your family. And Brown Eyed Photography will capture you and your newest love beautifully. Fresh Baby Shoots are penciled onto the calendar for your due date. When the baby is born, you let me know as soon as possible and we confirm a time for your session. When you’re interested in scheduling your Fresh Baby shoot, let me know! If you’d like to see more images, see the Fresh Baby gallery.